architecture of that era with an unobtrusive setback/terrace on the fourth level. 290 UNION STREET has been engineered and designed with utmost attention to modern conveniences and detail with state of the art installations. 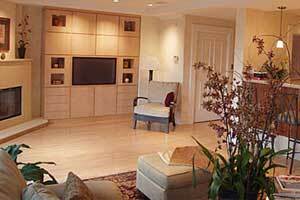 The floor plan is especially conducive to entertaining and comfortable City living. The focus of the house is the view of the Bay with the play of light and the ever-changing colors of sea and sky against the City’s landmarks. The plying of luxury liners, cargo ships and sailboats add to the excitement of the urban landscape. 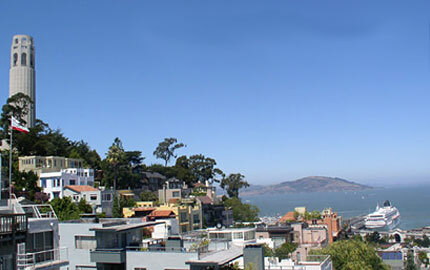 The new owner will truly enjoy being a Telegraph Hill Dweller! The stylish FOYER is paved with marble squares on the diagonal with alternating mosaic tile work. The light and airy custom staircase is a virtual sculpture and the focal point of the house. The graceful maple wood staircase makes eight turns to the fourth level, and is topped with a retractable skylight which lets in abundant natural light. Secluded, spacious MULTIPLE-FUNCTION ROOM opens to the landscaped garden. It may be used as Guest Quarters or At-Home Office or Billiard Room. Built-in wet bar & refrigerator. Adjoining tiled BATH with shower, walk-in closet. The ZEN GARDEN is a place for quiet contemplation. Stone steps lead to the antique carved stone fountain set against a Japanese plank and bamboo fence, surrounded by tall bamboo, a lovely maple tree and other greenery. Also off the Foyer are the Guest & Utility Closets and Laundry Room with tile surround, utility sink and stacked washer/dryer. 2-CAR SIDE-BY-SIDE GARAGE with faux finished concrete floor and convenient inside access to the ELEVATOR with impeccable maple clad cabin which services all four levels. From the LIVING ROOM guests will enjoy the views of Coit Tower, the bay and especially the cruise ships berthed at Piers 29-32. The room features a corner gas fireplace and custom built wall system which houses a 42 inch flat screen television and objects d’arts. The adjoining expansive view DECK is paved with matte ceramic tiles on the diagonal with pebble inlay. A spiral staircase leads to the garden below. For daily dining and informal entertaining, the breakfast bar with pendant lighting serves as a divider in the open KITCHEN. 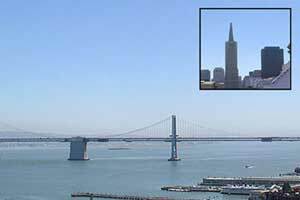 For formal entertaining in the DINING ROOM and on the front/south balcony, guests will be impressed by the glittering lights of the Bay Bridge, Embarcadero Center and Trans-America Pyramid. The POWDER ROOM and second guest closet complete this floor. SONITREL security system with monitor/intercom to the front door, intercom to all levels. Elevator by ACME HOME ELEVATOR CO. Architect (facade) : Carey & Co.
Binder for the New Homeowner may be viewed at the Property, along with architects plans and specifications. The Binder contains complete information about the property including: Certificate of Occupancy, permit applications and job cards, manuals and warranties for mechanical systems and appliances, names of service providers and maintenance schedules.